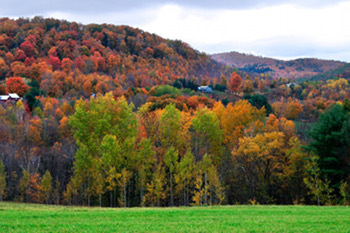 A typical Vermont bike ride–a bit hilly in really beautiful surroundings. From the Billings Farm this 24 mile ride involves about 1,100 feet of climbing. This really sweet ride ranks second on the October Country Inn list of great local bike rides. There are two route choices. 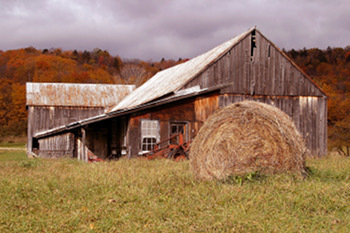 The 24 mile loop starts and ends at the Billings Farm just outside of Woodstock. The route winds up and down along narrow shouldered, but lightly traveled country roads through classic Vermont hill farm, and river valley scenery. This ride can be increased to 42.2 miles when combined with an out-and-back from the October Country Inn. Starting from the Billings Farm’s overflow parking lot. Exit the parking lot; turn right on Old River Rd for a short distance. Bear right onto, and follow Route 12 north until you reach the “Y” intersection with Pomfret Rd. (0.6 miles). Turn right on Pomfret Rd and follow it until Pomfret Rd. turns to the right when you reach the Teago General Store (2.6 miles). Follow Pomfret Rd. as it begins to climb, winding through incredibly beautiful hill farm country. When you reach the top of the climb (5.8 miles), shift into your big ring for a long downhill cruise. This leg starts out winding through open pasture land, and then funnels into a narrow creek side valley. Upon reaching the White River (11.8 miles), the road bends to the right, and follows the White River. This road dead ends at a stop sign (12.4 miles) at Quechee/West Hartford Rd. To the left is a bridge that crosses the White River, leads to Route 14, and the West Hartford General Store. Turn right onto the Quechee/West Hartford Rd. (unmarked) and begin to climb. At the top (15.9 miles) shift into high gear once again for a shorter downhill sprint. Keep on the lookout for a paved road on the right that intersects with the Quechee/West Hartford Rd. at a very shallow angle (17.6 miles). Carefully turn right on this road (Quechee Main St., unmarked), and almost double back in the direction you came. Follow this road through and beyond the Quechee Country Club. Turn right onto River Rd. (21.0 miles) when you reach the Taftsville covered bridge. At this point, River Rd. is hard packed dirt following the Ottauquechee River. River Rd. turns to pavement (23.2 miles). Turn right into the Billings Farm overflow parking lot to complete the ride (24.0 miles). 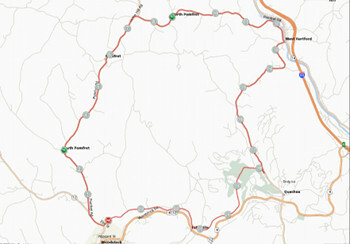 Download Pomfret Loop map. Download Pomfret Loop Directions.